Why did the gorilla like the banana? Because it had great a-peel! What with the bright yellow color, and fruity aroma, the gorilla had no chance against the tempting aura of this beloved fruit. This Halloween you can become every ape's favorite food when you wear this funny banana shaped costume. Have you ever wanted to be that guy featured on the jumbo tron at a baseball game? Well you dreams are about to come true. Normally, that lucky guy is dressed in some absurd get up, to ensure his getting noticed. Sometimes, it is even this here banana costume! You can also wear this costume for that annual work costume party that you always feel exclude from. It is so hard to find a quick and easy costume nowadays, we get that, but this one is pretty remarkable. It is one piece and can be put on in just seconds. All of your limbs will be free to move around, and your body will be encased in this yellow fruit. So get yourself one of these irresistible Plus Size Yellow Banana Costumes, and be ready to be the center of any screen or party! 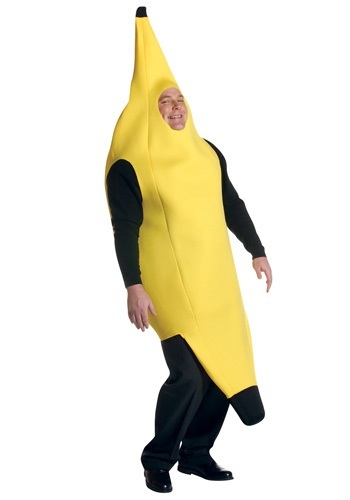 The entire costume is 100% polyester, and is just the one banana peel bodysuit. While this is a plus size banana costume, we do have a regular sized version, perfect for your entire family! Imagine if you had all of your family dress up as bananas for your annual Christmas Card. It would be a most memorable year, that’s for sure!